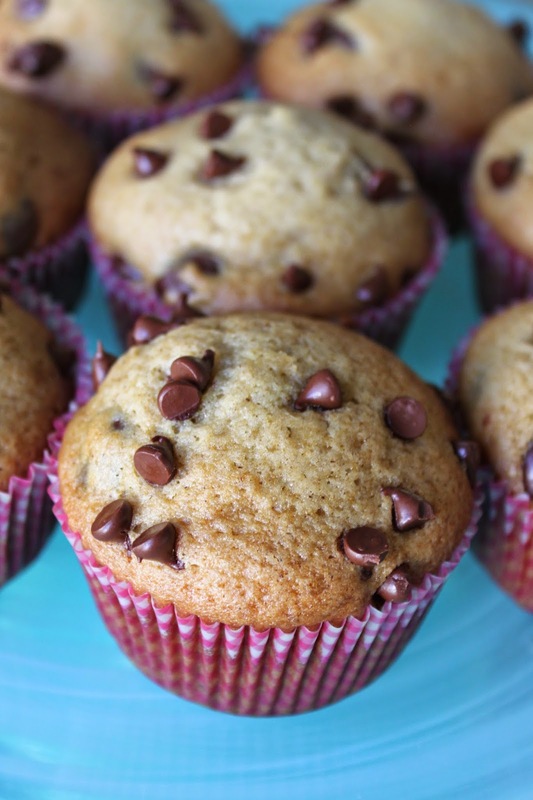 I love a good muffin and I love hosting guests over the holidays. I don't know about your house, but at mine we are up around 6:30 seven days a week. My two year has not discovered the joys of sleeping in. A typical morning involves us getting out of bed with him and eating cereal together as a family. Most days the baby sleeps a little later. This Thanksgiving we had family staying with us and I am sure a lot of you did as well. I never expect guests to get out of bed as early as we do and that is one of the reasons I love muffins. You can bake them well in advance, freeze them individually wrapped, and then warm them in the microwave anytime for serving. Everybody can enjoy a hot breakfast. This muffin uses my favorite muffin base. They are moist, filling, and delicious! Preheat oven to 400 degrees Fahrenheit. Grease 12 muffin cups or line with paper muffin liners. In a medium bowl mix together flour, salt, baking soda, and cinnamon. In a large bowl beat together eggs, white sugar, and brown sugar. Mix in oil, vanilla, and sour cream. Mix dry ingredients into wet mixture (be sure not to over-mix, batter will be lumpy). Gently fold in semi-sweet chocolate chips. 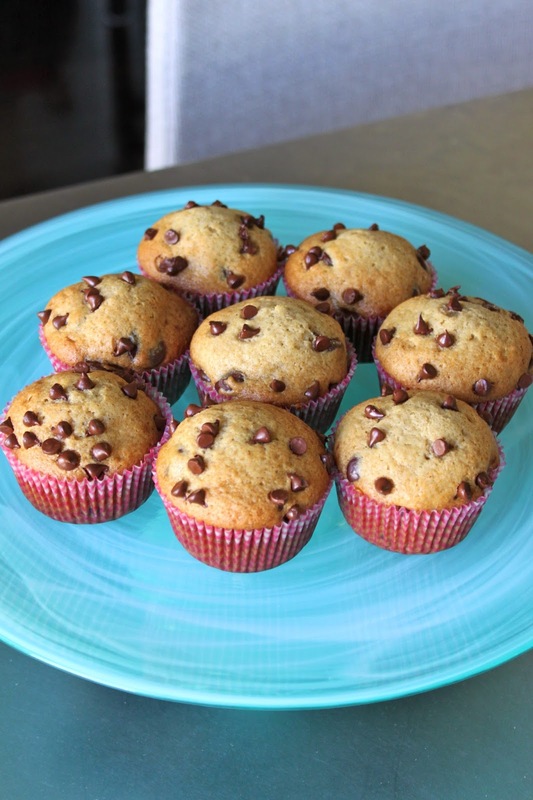 Scoop batter into prepared muffin cups so they are 2/3 of the way full. Bake in preheated oven for 10 minutes. After 10 minutes top with miniature chocolate chips and return to oven for another 10 minutes. Total bake time is 20 minutes. Best served warm. It is always cookie season around here. Everybody in my house loves a good cookie. I imagine that is true for most households. I like to give away treats of cookies and candies to my co-workers, friends, and neighbors this time of year. I am going to do my best to get a post to you every week in case you want to share in gift giving. I came up with these cookies on whim one day that my son was home with me. He loves to help out in the kitchen and I knew he would enjoy the colorful mini M&M's. Well I loved these cookies just as much as he did and so did everybody we shared them with. I highly recommend these. 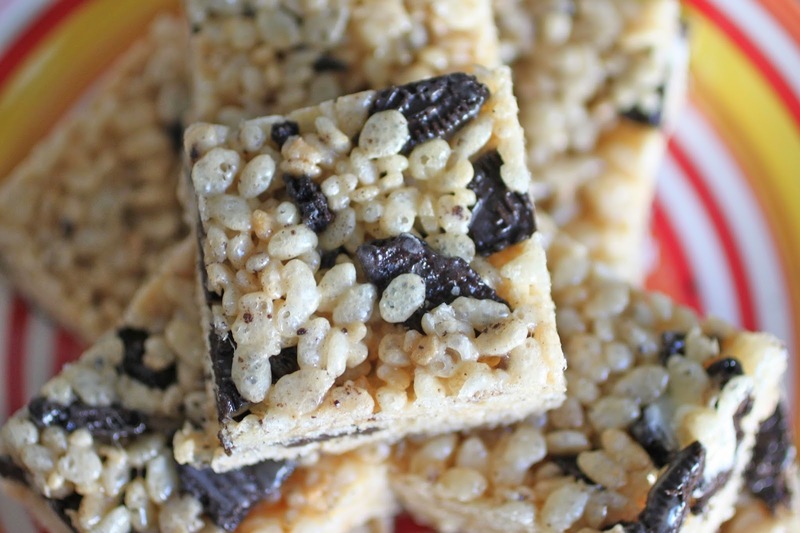 They are chery, crunchy, sweet, and salty. Also, I have a tip for you when it comes to holiday cookie making. Baked your desired amount of cookies. I typically bake one dozen. Scoop all the remaining cookie dough into round balls and lay them on a parchment lined cookie sheet. Put the parchment lined sheet with the cookie dough balls into the freezer for 20 minutes. After 20 minutes (it is okay if it is longer, I have accidentally left them over night), put the cookie dough balls in a plastic freezer bag. They will store for months if needed. When you want to bake for Company, your family, or to give away, just set them on your cookie sheet frozen and let thaw slightly for 15-20 minutes. Bake as suggested in the recipe. It may need an extra minute or two. Combine, flour, baking soda, salt and cinnamon in small bowl. Beat butter, granulated sugar, brown sugar, eggs and vanilla extract in large bowl. Gradually beat in flour mixture. 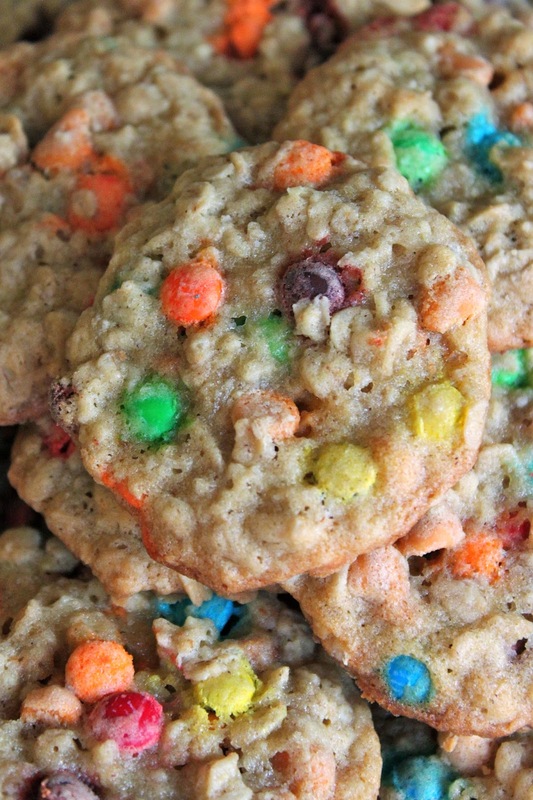 Stir in oats, butterscotch chips, and M&M's. Drop by rounded tablespoon onto ungreased baking sheets. Bake for 10-12 minutes. Cool on baking sheets for 1 - 2 minutes; remove to wire racks to cool completely. These are so simple, delicious, and fun. 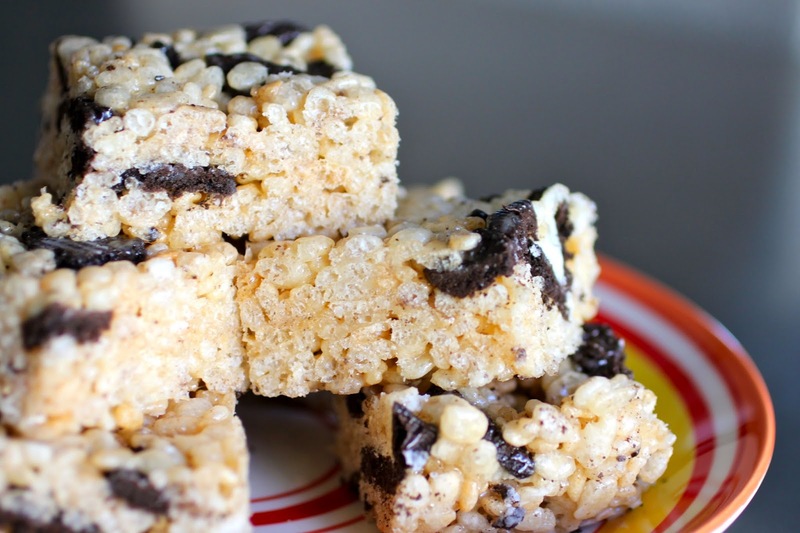 I rarely make cereal treats and thought it would be a fun way to use some leftover Oreos. Let me tell you, I was right. My two year old son helped me make these, which goes to show how simple they are. You can really mix just about anything into these. I know leftover Halloween Candy would work extremely well! See below for Give Away Winner! Spray a 13x9 glass baking dish and rubber spatula with non stick spray. In a medium sized sauce pan over low heat, add butter to melt. Once melted add marshmallows and stir continuously until the marshmallows have reached a smooth consistency. Remove from heat and fold in the cereal and Oreos® until completely coated. Add the mixture to the greased baking dish and smooth out evenly. Allow to cool before cutting into squares. We have a winner! Thanks to all who entered the Jif® Irresistible Peanut Butter Cookie Give Away. I have a ton of fun reading about your favorite cookies. The winner of the Give Away is TiffanyM who said " Mine are chocolate chip cookies. I've got a recipe that makes 8dozen so when I make them I have lots to spare." Please email me at bakedperfection@gmail.com so I can get the prize pack to you!